Spend your most romantic holidays in an exotic and fascinating place. 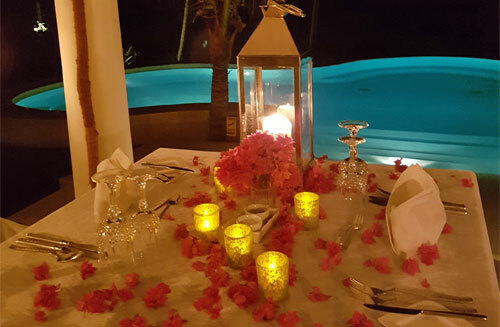 Enjoy your stay in our lovingly decorated honeymoon room with incredible sea view. 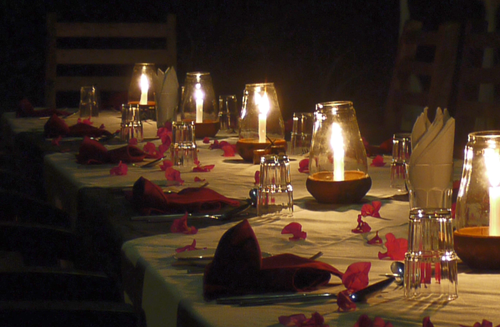 Have a romantic candle light dinner under the starry african sky, framed by tropical flowers and with sand underfoot. Choose one of our exclusive packages for three, five, seven or ten days. You are looking for a perfect accommodation for your family reunion or for holidays with your friends? Book the entire villa, be detached from every day life and be spoiled by our team. You want to surprise your beloved one with an extraordinary idea? For her/his birthday, jubilee, anniversary or to propose marriage? Please contact us, we will organize something very special for you.